To search for files, folders, programs and other items on your computer, either access search by pressing on the Start menu, or by pressing the Windows key+F. Once in search, just type in what you want to find in the search box and press Enter. Learning how to use search in Windows Vista is important as search can find practically everything on your computer, except certain things that Windows hides or protects. For example, it can find windows media player even if you only type play in the search bar, but it cannot find things that are in archive file formats (such as RAR and ZIP), the Recycle Bin, and in certain "sensitive" Windows system locations. I would recommend clicking search everywhere, and then selecting Advanced Search to search everywhere and including non-index, system, and hidden files if you are having trouble searching for something that you cannot find. Also remember that with the search function, you can search for emails, documents, pictures, music, and more at the top of the search window. If you want to search just a CD in your disc drive, you can also do that by simply changing the location of your search to the CD or DVD drive. If you know the extension of the file you wish to find (such as jpg), you can also search the extension by typing it into the search bar. When you have found the file you were looking for, just right click it and open it's location, open the file itself, view its properties, etc. Please note: Searches in programs are usually application specific, but Windows Search generally finds everything (when you press the Windows key+F). You may also save a search by clicking on the "Save Search" icon in a search window. You can save the search as whatever you want, but when saving, choose to "Browse Folders" so that you can save the search to a place where it will be easily accessible (such as the Desktop). When you want to see your saved search results in the future, just press the Windows key+M and click on the icon with the magnifying glass and files in the background. 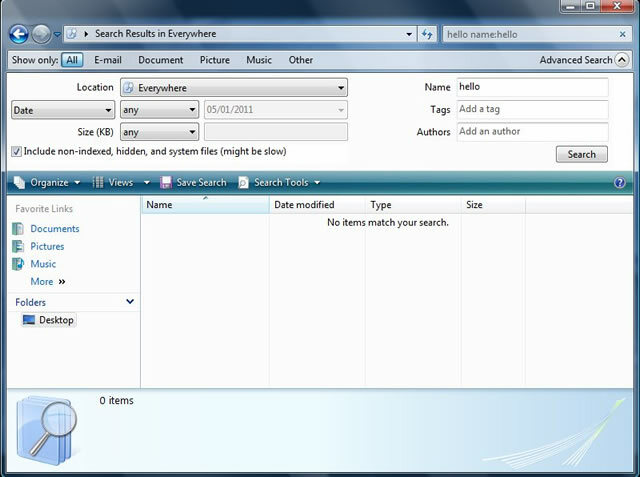 This is your saved search results file and Windows will automatically load the search window and your previous results. Why save searches? It is a good idea to save searches when your computer just searched for an hour to find files you needed to rename/delete/scan for viruses, etc. Also, you can search for really big files on your computer to delete or old files from applications that you uninstalled and don't need anymore. Thanks for reading my article on how to use search in Windows Vista.